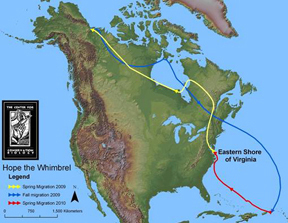 Bryan Watts, director of the Center for Conservation Biology, said Hope is the first of the shorebirds to be tracked by satellite over the full circle of its annual migration, which extends from the tropics to the arctic in a looping path that covers more than 14,000 miles. Watts said the center staff is anxious to get to the Eastern Shore to obtain visual confirmation of Hope’s arrival. Hope covered approximately 1,660 miles in less than two days on her trip from St. Croix. She even has settled on the same marsh where she was captured in the spring of 2009. Watts said that Hope’s journey has confirmed how much the life cycle of whimbrels is dependent on specific staging sites, “layover” areas where birds can rest and feed before resuming their long migrations. Hope and other satellite-tracked whimbrels are revealing that the migrations of the species are surprisingly structured, he added. Hope is one of several birds that have been fitted with state-of-the-art 9.5-gram satellite transmitters in a collaborative effort by the Center for Conservation Biology and the Virginia Chapter of The Nature Conservancy to discover migratory routes that connect breeding and winter areas and to identify en route migratory staging areas that are critical to the conservation of this declining species. Virginia’s Eastern Shore—and the Delmarva Peninsula in general—hold several such staging areas. Updated tracking maps for Hope and other whimbrels may be viewed online. Watts said that Hope arrived on her spring staging marsh a bit earlier than expected. Most of the birds won’t be coming in for another two weeks. An early arrival probably means that Hope will leave early as well. Watts said the CCB will continue to track Hope as long as the transmitter holds out, although he says the unit is “on borrowed time.” The solar-powered tracking unit recharges continually, but he says the trackers rarely last a year.